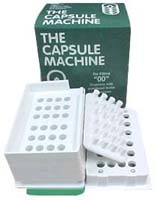 THE CAPSULE MACHINE - Make your own Custom Supplements at home! Making your own custom supplements has never been easier or more affordable. 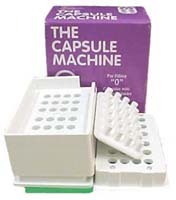 The benefits of making your own custom blends are numerous and our Capsule Machine allows you to make 24 capsules in about two minutes. Save Money - Much of the cost of a nutritional supplement comes from the expense of encapsulating, bottling, and labeling the product. By manufacturing your own, your supplement costs can be a fraction of what you currently spend. Customize to Your Needs - Have you ever spent hours of your time researching nutritional ingredients only to discover that you can't find a premade supplement that meets your requirements? Making your own supplements allows you to make a custom fit for your unique needs. Mask Unpleasant Flavors - Do you like taking pure bulk nutritional ingredients but sometimes find it hard to stomach the taste? (Red Yeast Rice or Spirulina for example). Encapsulating eliminates the taste issue! Avoid Fillers - By making your own nutritional supplements you can avoid the fillers and flow agents required in mass production. Often the only way to accomplish this is by hand encapsulating. Purer Supplements = Higher Quality. 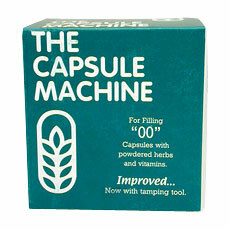 As a general rule one teaspoon will fill about 7 size "0" capsules or about 5 size "00" capsules. The actual number will vary depending upon the density of the material used and how firmly it is tamped.